Triple H and Johnny Saint announced the NXT UK Women's championship tournament, which begins next week. Wolfgang beat Ashton Smith in the main event, further establishing himself and the Coffey Brothers as a force to be reckoned with. Tyler Bate beat James Drake in the match of the show, while Jordan Devlin looked good in beating Sid Scala and we had Saxon Huxley & Joseph Connors beat Amir Jordan & Kenny Williams. A fun show, especially the Bate match, but really not a must-see episode. Triple H and all the women of NXT UK - Dakota Kai, Nina Samuels, Toni Storm, Isla Dawn, Rhea Ripley, Xia Brookside, Jinny and Millie McKenzie - were out on the stage to open the show. The way this was shot, Ripley, who really only is 5'7" looked huge compared to the other women, both in height and massiveness. Triple H called out Johnny Saint, who unveiled the new NXT UK Women's championship. The tournament for this new title will begin on the next episode. There was a look back to when Wolfgang and the Coffey Bros. attacked Ashton Smith a few weeks back. 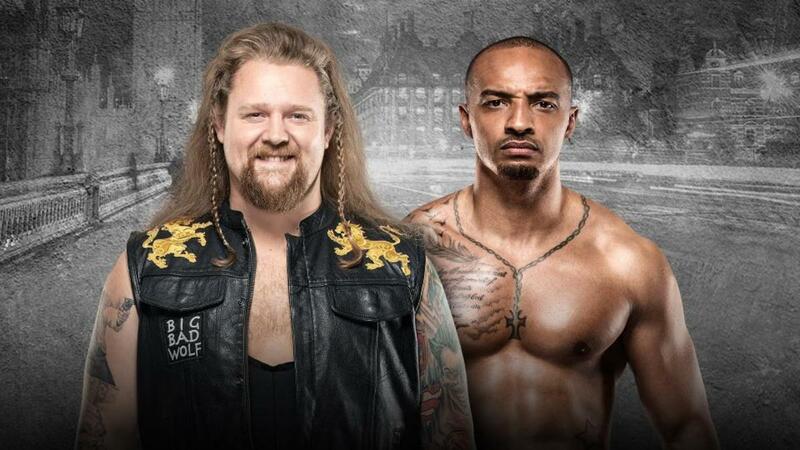 A graphic announced that Smith and Wolfgang would face off in tonight's main event. Also announced was Tyler Bate vs. James Drake. After a promo announcing WrestleMania 35 tickets going on sale, we went to our first match. Devlin locked up right away and backed Scala into a corner, screaming "you don't belong here" at him. Scala briefly fired back, but was hit with Devlin's uranage/standing moonsault combination. Devlin kept working Scala over and launched himself over the ropes from the apron with a beautiful somersault cutter. He went for the Island's Call, but Scala turned it into a sunset flip. Devlin kicked out but Scala hit a jumping neck breaker and went for a body press off the top. He jumped into a dropkick by Devlin, which looked to have missed by a mile. This set up a successful Island's Call for the victory for the Irishman. Radzi Chinyanganya interviewed Devlin in the ring post-match, telling him that this was a dominant performance and if we had seen the real Jordan Devlin yet. Devlin fired back to not make him laugh and that the last thing concerning him was having those people here know who he was. Whenever he's backstage, he's asking himself who all the people back there think they are, especially the guy running around as a luchador, even though he is from Leeds, so who does Ligero think he is? I have a feeling these two will square up in the coming weeks. After a look at Moustache Mountain's promo from a few weeks back, Nigel and Vic talked about the upcoming NXT UK tag team titles and how we'd be seeing some teams form. In fact, two of those teams would have a match next, when Amir Jordan & Kenny Williams face Saxon Huxley & Joseph Connors. After a WWE Network promo, we got a video introducing us to Tyson T-Bone, who said he'd been traveling up and down the country, beating people and that he was the biggest, baddest and meanest WWE UK (he didn't say NXT UK) wrestler. He'll debut next week. We saw everyone but Conners on NXT UK before, because he got injured in a match with Kenny Williams during the first day of the July tapings and the match was stopped, never making air. He started out in 2006 and was trained by Robbie Brookside, among others. He's a mainstay at Southside Entertainment Wrestling and competes for other promotions such as Defiant, PROGRESS, ICW, IPW:UK and Preston City Wrestling. He's a 3-time former SWE Heavyweight champion and three-time SWE tag-team champion and also was Defiant champion, back when it was WCPW. Williams came out wearing old-school red and blue 3D glasses and we were told that Jordan chose wrestling over an arranged marriage by his mother. Oh well, good for him I guess. Huxley and Amir started out and Amir escaped some take down by flipping out, kipping up and doing his funny foreign man dance, because stereotypes. He tagged in Williams who quickly got distracted for the heel advantage. Conners tagged in and we were told that he lost part of his left ear in a bar fight years ago, where he was "left for dead". Amir was face in peril for a while, until he managed to hit an enzuigiri and made the hot tag. Williams hit a cool spot where he hit a shotgun dropkick onto Conners on the outside, then skinned the cat back into the ring and hit a suicide dive on Huxley on the other side of the ring. He missed a DDT from the top rope and was hit by a brutal sunset bomb by Conners into the corner, followed by Don't Look Down for the victory for the heel team. After another graphic for Bate vs. Drake and a promo for the NXT UK tapings in ten days we were shown the brackets for the NXT UK Women's championship tournament and got nice graphics for everybody, including when they made their WWE/NXT debuts. This was followed by an interview with Trent Seven by what looked like a number of journalists. He was asked his opinion on Zack Gibson and said that while it was impressive how Gibson won the UK tournament at Royal Albert Hall, he couldn't get the job done against Pete Dunne and had been calling out the other members or British Strong Style ever since. When asked if he was challenging Gibson, he said that he was a pro wrestler and a sports entertainer and told Gibson to have a go. Those two will face off on the next episode. Drake has a picture of his face on his trunks, so he received the "he's got his own face on his arse" chant from the UK crowd here. They traded arm twisters early, which Bate flipped out of, followed by a dropkick and a suplex escape over the top rope onto the apron and hit a big chop. Drake punched Bate off the turnbuckle to the outside. Bate escaped a lengthy chin-lock sequence by backing Drake into the corner and hit a beautiful standing huracanrana, followed by a spinning elbow off the second turnbuckle. Drake charged into Bate in the corner, but got caught and received an overhead suplex for his troubles, followed by a running Shooting Star Press. Drake flipped over the ropes onto the apron but when Bate teased a suicide dive, Drake jumped to ringside, and Bate launched himself back into the ring with the top rope between his neck and shoulders spot, before hitting an actual dive. Back in the ring, Bate hit a backdrop driver for a near fall. The first attempt at the Tyler Driver '97 got turned into a back body drop and Drake hit a running dropkick into the corner for a near fall. A second attempt at a dropkick failed though, as Tyler moved, hit his springboard lariat off the ropes and finished his night with a Tyler Driver '97 for the victory. After a WWE Shop commercial, we had another look at all the women in the tournament, which will start next week. Wolfgang won in 5:29 after a modified fisherman's suplex. The crowd was behind Smith all the way, chanting to his entrance and generally being very cheerful. Smith hit things off with a cravat, but ate some punches from "The Last King of Scotland" for his troubles. He came back with a nice dropkick, head scissors and a springboard tomahawk chop, but then jumped right into a gut buster as he went for a body press off the top. Wolfgang dominated the back and forth exchange that developed from there and stopped Smith in his tracks with a bear hug. Smith eventually fought out, hit a clothesline, then leapfrogged Wolfgang as he charged out of the corner, landed on the second turnbuckle and hit a reverse enzuigiri for some momentum. This didn't last long, as Wolfgang launched Smith into the air, then launched himself at a stunned, seated Smith with a running senton and finally hit a modified fisherman's suplex into a slam for the victory. Wolfgang and the Coffeys posed in the ring as the show went off the air.